A Twitter message that swept through social networks on Saturday claimed that Vladimir Putin, who divorced in June, tied the knot again earlier in the day at the Iversky monastery in the Novgorod region. A presidential spokesman has called on Russians to respect Vladimir Putin’s private life, commenting on recent online rumours that the Russian leader has remarried in a church ceremony at a secluded monastery. In an interview with Russia’s Izvestia daily, published on Wednesday, Putin’s spokesman Dmitry Peskov said the president’s hectic schedule leaves little time for personal life. “We voted for [Putin as] president when the election took place, so let’s focus on what kind of president he is. What kind of man he is, whether he has a wife or not – let’s leave it to him, [let’s] not interfere,” he said. “He is not obliged to speak about his personal life to anyone. There’s only one thing I can say – frankly, even I have difficulties in answering questions about his personal life. He works so hard that I have no idea about where would it [personal life] come from,” Peskov went on. A Twitter message that swept through social networks on Saturday claimed that Putin, who divorced in June, tied the knot again earlier in the day at the Iversky monastery in the northwestern Russian Novgorod region while the area was cordoned off by security personnel and police. “I indeed received many calls on Sunday. And I was truly amused by these calls, answering that the only problem is that Putin is currently in Sochi,” the spokesman said, adding that he had no idea of why the area was cordoned off. He said that although similar rumours “have nothing to do with the reality,” there was little sense in refuting them, because they would continue to circulate anyway. Peskov also commented on another rumour, about Putin’s possible nomination for the Nobel Peace Prize for his role in settling the Syrian civil conflict. The spokesman said he was unaware who nominated Putin and whether this person was entitled to do so. He said that, however, tangible results should be reached first. He also reiterated that Putin’s words about the possibility of running for presidency in 2018 were only a “standard response” traditional in such situations. During a question-and-answer session following Putin’s speech on Russia’s national identity, he asked former French Prime Minister Francois Fillon whether the latter planned to run for his country’s presidency; Fillon said he would reply only if Putin answered the same question – to which Putin said, “I don’t exclude [the possibility].” “And I, too, don’t exclude [the possibility],” quipped Fillon. “I wouldn’t consider it as a pre-election statement or decision. 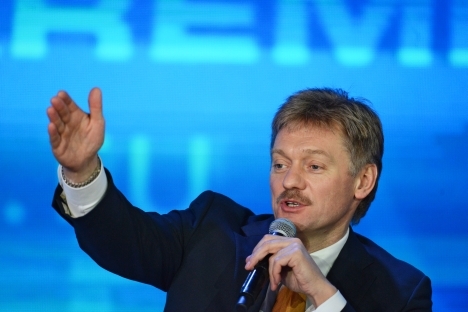 It’s too early to discuss this subject,” Peskov said.